Overview An online platform and physical kiosk that allow visitors to design their own chocolatey treats. We were initially approached by Candy Mechanics to build custom online editors that would allow people to create their own card designs, engraved into chocolate bars. The editor was built into an e–commerce site so that users can then purchase their own designs. 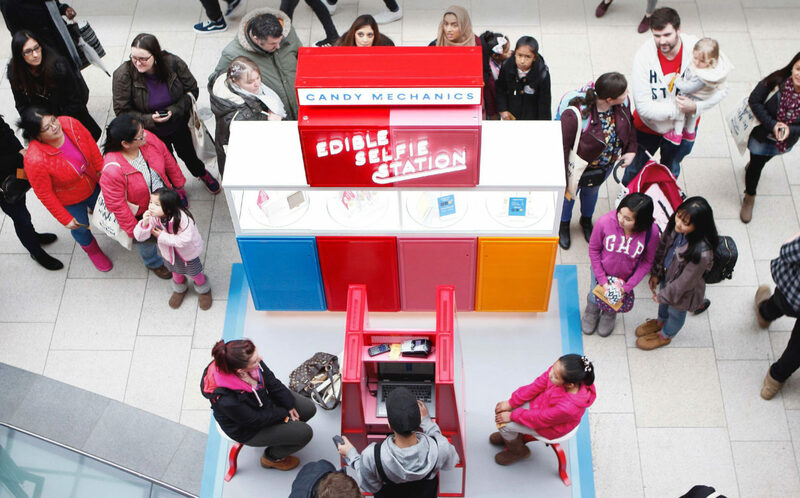 These editors were also adapted by us to be used in-store in the form of a pop-up kiosk. The Candy Mechanics Candy Card editor allows users to add text and graphics to a number of different flavoured chocolate bars. Users can manipulate the designs further by scaling, rotating, changing fonts and applying finishes. Once purchased the designs are automatically exported as SVGs ready to be cut by a CNC machine. Additionally, users can choose to start their design from a premade customisable template. One challenge of building the editor was creating an easy to use mobile version. For this we scaled back the interaction and simplified the tools. We also built the Candy Mechanics Lolpop editor which allows users to take a video of their face and - through photogrammetry - create a three dimensional model of their head, which can then be cut CNC machine be turned into a chocolate lollipop. The in–store kiosks were made by adapting the existing online editors but – with the benefit of a touch screen – users could also draw their own graphics. The kiosks have toured around the country in various shopping centres.